John Patrick Singson is a soft spoken and approachable person but firm in all his decisions especially for the good of the community. His passion to serve led him to help a lot of people not only in his immediate barangay but mostly Bigueños. He is a dedicated public servant who will continue to perform his mandate of giving quality service to the people especially those in need. He started in politics by being consistently the number 1 barangay kagawad for consecutive terms in Barangay VI. After which he ran unopposed in his first attempt as Barangay Captain and consequently won as the ABC President unopposed. He envisions to unify all the barangays as strong development partners of the City Government for a better and progressive Vigan. Information technology has been the economic and political structure of domestic institutions, of states, and the relations between states. Recognizing such development, ABC Pres. JP Singson led the barangays into the digital landscape by being the first and only Liga ng mga Barangay in the country to put up its own website. The products and services in the barangays are highlighted in the website to fully realize the barangays' economic potential. Exposure of the barangays of Vigan City to the internet would facilitate an open, speedy, and efficient online transmission of barangay reports, barangay citizen's charter, downloadable forms and other information to every barangay and all government agencies. Although Republic Act 9485 gives directive only to government agencies, departments, GOCCs, offices and bureaus to set up their respective service standards known as the Citizen's Charter, the Liga ng mga Barangay under Councilor Singson's leadership developed and implemented the Citizen's Charter at the grassroots level, the barangays. Now, the residents of the barangays of Vigan City are among the first in the country to have their own procedure to obtain a particular service promoting integrity, accountability and transparency in line with the Anti-Red Tape Act of 2007. - ESTABLISHED THE LIGA NG MGA BARANGAY WEBSITE TO SHOWCASE THE ECONOMIC POTENTIALS, ATTRACTIONS, SERVICES AND TO POST SUMMARY OF INCOME AND EXPENDITURES OF ALL BARANGAYS. - ENSURED THE BARANGAYS FULL DISCLOSURE POLICY TO MAKE TRANSPARENCY, ACCOUNTABILITY AND HONESTY IN GOVERNANCE AS A STRONG PILLARS IN THE COMMUNITY TO ERADICATE GRAFT AND CORRUPTION. - LED THE BARANGAYS TO STRENGTHEN THE FIGHT AGAINST DENGUE OUTBREAK BY SETTING UP OL-TRAPS & INTENSIFY THE CLEAN-UP DRIVE. ORD. 03-2008 REQUIRING ALL BARANGAYS TO HAVE THEIR OWN SEAL. RES. 04-2008 REQUESTING CONG. 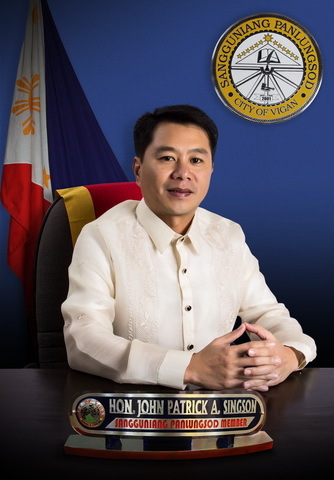 RONALD SINGSON TO ALLOCATE FUNDS FOR THE PURCHASE OF 1 TRACTOR 78HP, 2 MECHANIZED RICE REAPERS AND 2 MECHANIZED CORN SHELLERS FOR USE OF VIGAN CITY FARMERS. RES. 21 2008 APPEALING TO THE SENATE FOR THE IMMEDIATE RATIFICATION OF UN CONVENTION ON THE RIGHTS OR PERSONS WITH DISABILITIES. RES. 43-2008 AUTHORIZING MAYOR EVA MARIE MEDINA TO ENTER INTO A MEMORANDUM OF AGREEMENT WITH THE MUNICIPALITIES OF BANTAY, CAOAYAN, SAN VICENTE, STA. CATALINA, STO. DOMINGO AND SANTA FOR THE ESTABLISHMENT OF METRO VIGAN COORDINATING COUNCIL. ORD. 06-2012 ESTABLISHING THE PERSONS WITH DISABILITY AFFAIRS OFFICE OF VIGAN CITY. ORD. 09-2012 FORMULATING THE POLICIES ON MANDATORY PRE-EMPTIVE EVACUATION OF VIGAN. RES. 10-2011 SUPPORTING SENATE BILL 2578, AN ACT GRANTING ₱1,000.00 MONTHLY ALLOWANCE TO BARANGAY TANODS & SENATE BILL 1323, AN ACT PROVIDING RETIREMENT BENEFITS FOR THE PUNONG BARANGAY & MEMBERS OF THE SANG. BARANGAYS WHO SERVED 3 CONSECUTIVE TERMS. RES. 25-2013 REQUESTING HON. CONG. RONALD V. SINGSON TO PROVIDE TWO SPECIAL EDUCATION CLASSROOMS FOR THE CHILDREN WITH DISABILITIES AT VIGAN CENTRAL SCHOOL. RES. 35-2013 REQUESTING SENATORS CYNTHIA VILLAR AND BENIGNO AQUINO IV TO PROVIDE A COLD STORAGE FACILITY FOR THE VEGETABLE PRODUCTS OF THE FARMERS OF VIGAN CITY. RES. 37, 38 & 51-2013 REQUESTING THE PROVINCIAL GOVERNMENT THROUGH GOV. RYAN LUIS SINGSON FOR THE CONSTRUCTION OF DRAINAGE CANAL OF THE ACCESS ROAD AT THE NORTH SIDE OF UNP, ALONG ZAMORA STREET, & AT RIVERO ST., VIGAN CITY. RES. 52-2013 REQUESTING SEC. ROGELIO SINGSON TO EXTEND FINANCIAL ASSISTANCE FOR THE RIVER IMPROVEMENT & MAINTENANCE OF ROAD ALONG THE BANK OF GOVANTES RIVER. RES. 16-2014 REQUESTING THE PROV’L GOVT. THROUGH GOV. RYAN LUIS SINGSON FOR THE CONCRETING OF THE BRGY VI TO BRGY IX ACCESS ROAD LOCATED ALONG THE MESTIZO RIVER BANK. RES. 41-2014 GRANTING CESAR BURGOS FRANCHISE TO OPERATE AND MAINTAIN THE VIGAN CITY COCKPIT ARENA. RES. 59-2014 AUTHORIZING MAYOR EVA MARIE S. MEDINA TO ENTER INTO A MOA WITH DPWH REGION 1 FOR THE INSTALLATION OF 185 STREET LAMPS ALONG VIGAN-BANTAY ROAD AND VIGAN AIRPORT ROAD. RES. 35-2015 REQUESTING THE PROV’L GOV’T OF ILOCOS SUR TO ESTABLISH A PROJECT FOR FISHERMEN SIMILAR TO THE RYAN HYBRID RICE ASSISTANCE PROGRAM THAT WILL INCREASE FISH PRODUCTION IN VIGAN CITY. “A RESOLUTION REQUESTING REPRESENTATIVE RONALD V. SINGSON, CONGRESSMAN OF THE 1ST DISTRICT OF ILOCOS SUR TO EXTEND FINANCIAL ASSISTANCE TO THE CITY OF VIGAN FOR THE ESTABLISHMENT OF THE VIGAN CONSERVATION COMPLEX, FROM FUNDS UNDER HIS DISCRETION”.